If you are looking for a private instructor for drumset, marching percussion, orchestral percussion, keyboard percussion (marimba, xylophone, vibraphone), latin percussion, piano, or to learn the Finale songwriting software, you have come to the right place. I began teaching in 2002 and have loved every minute of it! I have taught students ranging from ages 5 to 75 years old! Each student has different talents and desires, so I cater my lessons to what the student needs to learn in order to grow as a musician. I teach 30 minute or 1 hour long lessons, depending on what the student would like. I offer reasonable and competitive rates. 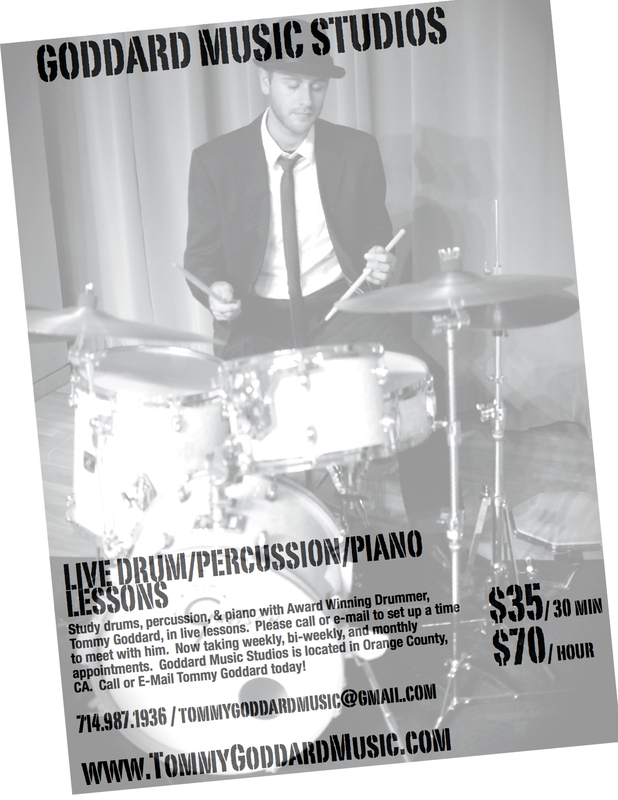 Goddard Music Studios is located in Orange County, CA. If you do not wish to fight the crazy California traffic or you might live in another part of the country, Goddard Music Studios offers lessons online. All you need is access to Skype or iChat. Skype is a free program that can be downloaded from the Internet. It can be used on the following devices: PC computers, Apple computers, or anything that has the Skype application, including iPads, tablets, phones, etc. iChat, which is installed on Apple computers, can also be used. Venmo, Pay Pal, or Chase Quick Pay is utilized for payment. Please contact me for further details. Goddard Music Studios is located in Orange County, CA. Because I have sound isolating and sound absorbing materials being used in my studio, lessons can be conducted any time of day. This allows for flexibility for the individual student. I offer reasonable and competitive rates. Acceptable payment includes: cash, personal check, or Venmo. Please contact me for further details. Rehearsal Progress Sheet - You may download and use this sheet to keep your practicing consistent from week to week! Let me know if you have any questions and I will assist you. 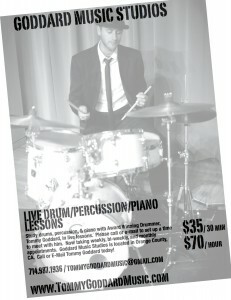 Please contact me today for lessons and I will make sure that you will learn and grow as a musician! Please “Like” my Goddard Music Studios Facebook page!